Alas, however, time flies when one is packing, saying au revoirs and otherwise getting ready to leave another phase of one's life so that yet another can begin. So before I turn in for the night (and have this blog go on what hopefully will be but a brief hiatus), here's "just" going ahead and thanking all of you who have written, be it on the comments section of yesterday's blog entry or by e-mail, to send along congratulations, wish me well, tender advice and signal your willingness to meet up with me after I get in to Hong Kong. As some of you may have noticed, something has been awry with this blog's "Labels" section for a few weeks now. For example, and for reason that I can't fathom, although I have personally only attached a "HKIFF" label to a total of fourteen out of -- including today's -- the one hundred and thirty-nine posts on this blog, the section of Blogger that's charged with counting such things appears insistent that their actual number is thirty-seven. Additionally, although I have attached a "Mainland China" label on to only eleven of this blog's posts, the relevant section of Blogger has, again, decided to inflate the number -- this time up to twenty-six! 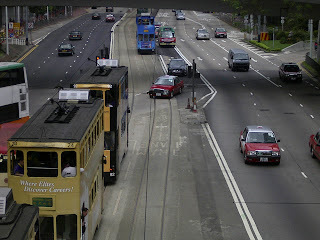 At the same time, although the number of posts labelled "Hong Kong" and "Penang" respectively also have been artificially inflated by the Blogger machinery, it's true enough that there are more Hong Kong- than Penang-focused posts on this blog. This is something that may strike some of you who are reading this as on the weird side. 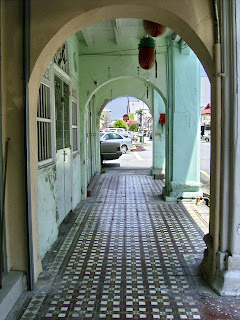 After all, as I have revealed on this blog, I not only currently reside in Penang but it also is where I was born, was raised for the most part, and is the part of the world which I consider to be my ancestral home; with at least one branch of my family being able to trace back its residence in this area by at least five generations in addition to my parents having been true blue Penangites years before Malaysia achieved its political independence from Britain. 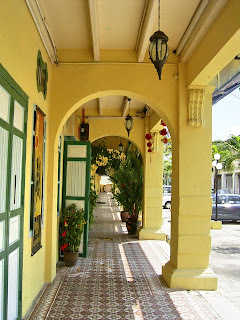 However, the fact of the matter is that I've actually spent more years of my life outside of Penang than in it. For the record: These include a spell at boarding school in Britain, four years at college at Beloit (in Wisconsin, U.S.A.), eleven years or so -- spread over two separate spells -- in Philadelphia (also in the U.S.A.), two years in Tanzania, and another two years working in Kuala Lumpur (Malaysia's capital city) before I returned once more to Penang in August 2005. And as far as Hong Kong is concerned...well, firstly, the cinema of Hong Kong has been a big passion of mine for some years now. Furthermore, at some point amidst it all, my love of Hong Kong movies got me starting to love the territory from whence they came and which many of them so lovingly and vividly as well as colorfully depict; and to such an extent that I not only took to regularly visiting Hong Kong but nursing fantasies and dreams of some day getting to live there. To cut what could be a pretty long story short: In only a little bit more than thirty-six hours from now, I will be getting ready to board a plane that will send me on my way to making that dream into reality. Put in more prosaic terms: four days ago, I formally accepted a job offer that will see me start work in Hong Kong on May 2nd, 2007 (i.e., just three days from today!)! As you can imagine, it was quite the scramble to find a place to live in time for that fast looming start date! But a place -- in one of those parts of Hong Kong which has been featured in more than one local Hong Kong movie, no less! ;b -- has indeed been found that should at least temporarily serve my purposes. The Kek Lok Si Temple (AKA "Temple of Supreme Bliss" or "Pure Land Temple") that's situated on Huock San (trans. 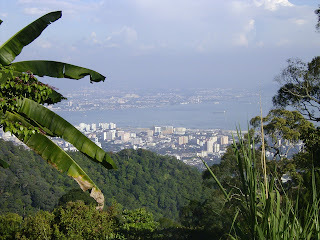 Crane Hill) is said to be the most visited tourist spot in Penang. This prominent local landmark which can be seen from miles away and dominates the surrounding Air Itam (AKA Air Hitam; trans., "Black Water"!) area -- yet appears to still be constantly being added to! -- also is widely considered to be one of the finest Buddhist temples in Southeast Asia as well as is generally recognized as the largest Buddhist temple complex in Muslim majority Malaysia. In the middle of my photograph of what is just only a section of the Kek Lok Si Temple stands its most famous structure: A rare -- unique, even -- pagoda variously known as the Pagoda of Rama VI (on account of the temple's foundation stone having been laid in 1915 by King Rama VI of neighboring Thailand) as well as the Pagoda of Ten Thousand Buddhas (because it supposedly is home to ten thousand images of Buddha; many of them affixed on to the interior walls of the structure). More specifically, the 30 meter high pagoda combines a Chinese octagonal base with a tre-foil arcade- and niche-rich middle tier that is of Thai design and a Burmese domed crown; with the idea behind this being that this religious tower physically testifies to the Kek Lok Si Temple's embracing of not only Mahayana Buddhism (as represented by its Chinese elements) but also Theravada Buddhism (as represented by its Thai and Burmese sections). Many people, as is their wont, don't bother to look at what is under their feet. This can seem like a real pity; and perhaps particularly so in Penang. One reason for my thinking this is that, given the dilapidated condition of some of the drain covers -- or, in some cases, their outright absence! -- in George Town, to not look where walk when you're walking about Penang's capital city can bring about a pretty unpleasant fall into a yucky drain! 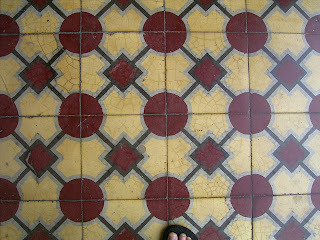 For another, to not at least look down on occasion when you walk on the side of a Penang road, lane and street -- or into one of the traditional shops or houses in town -- is to risk missing out on beholding the beauty that's right below your feet. 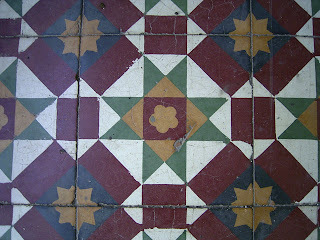 More specifically, as this photo-essay seeks to show this blog's readers, a whole bunch of colorful plus patterned floor tiles can be found adorning many a verandahed and pedestrian five-foot way and traditional shophouse or more regular house floor over here. 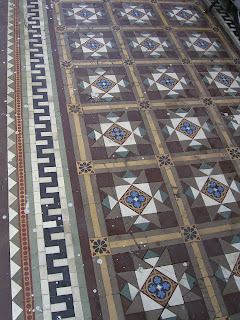 As time went by though, the practical became mixed with artistic tendencies and elements. 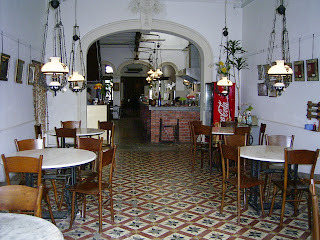 And when the architectural style known as Straits Eclectic reached its zenith, public and private floor spaces as well as the walls of houses got covered with sets of colorful tiles, some of which were imported from as far away as Britain (i.e., the colonizers' native land) to this Southeast Asian space that's been made all the richer for their inclusion into the local built landscape. Another day, another meme. This one came courtesy of Collecting Tokens' Alejna and, interestingly, has her e-mailing five questions that were completely of her choice to answer as a follow-up to someone else having done the same with her. I'm not sure I can pinpoint a single childhood memory as the happiest of the lot. However, I can recall many happy times spent in England exploring museums (yes, really!) in the company of my mother and being allowed by her to go on buying sprees in more than one bookstore there. As I disclosed in an early post on this here blog: for a good part of my childhood, I used to regularly spend part of each year in England. However, what may not have been clear previously is that this involved my being taken out of the Malaysian schools I attended for weeks at a time. Alternatively put, my parents got me playing "hookey" for significant periods of each year! As compensation, my mother would see to it that we did educational things while there -- like go visit museums and other places of cultural and/or historical interest (of which there are, to put it mildly, quite a few in England!). And lots of reading. Only, for the most part, she didn't dictate which museums and other places to visit or even what I would be reading. 2. What do you see yourself doing in 10 years? Are there any particular goals you'd like to accomplish in that time frame? For the record, this is the only question of the quintet that I've been asked before by others. And, as I told Alejna, usually in job interviews and/or by individuals who were my bosses at the time of their asking this question! Also for the record: My response these days -- one which can seem to freak people out -- is that I no longer try to look 10 years down the road and, instead, tend to only look at my life and related matters in, at most, six month increments!! My reason for this is that once upon a time, my life path did seem like it could have been as predictable as that of a train's but, especially over the past 10 years or so, my life has taken such unexpected twists and turns -- much of which I truly feel were beyond my control -- that I no longer am inclined to try to predict nor seek to purposefully and single-mindedly dictate the course of my own long-term future. Instead, I'm content to see what life brings and respond as well as react accordingly to the surprises along with more expected developments that it tends to turn up. 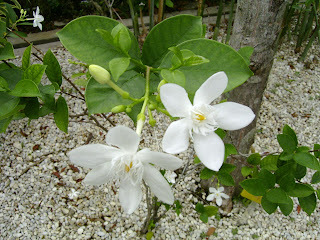 This way, I feel that my life path is more flexible and open to interesting possibilities. And even while this way of living can bring with it its share of anxieties, I think it compensates by being more exciting as well as generally less disappointing. 3. If you had the power to bestow a gift upon a baby girl, such as those given by fairy godmothers in a fairy tale like Sleeping Beauty, what gift would you bestow? If you could bestow three such gifts, what would they be? If I could bestow just one gift, it would be the ability to think for herself. 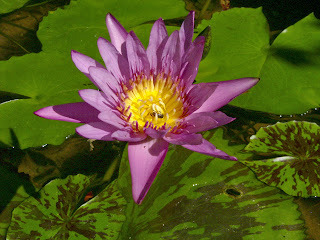 And if I could bestow two others, it would be a good -- as in caring as well as physically healthy! -- heart and the ability to not take herself too seriously. This way, I hope, she'll grow up to be a wonderful individual who will do some good in the world, and without getting an over-inflated ego while doing so! 4. Let's go with the inanimate object route. If you were a box, what kind would you be? Describe yourself, your uses and your contents, if any. "Boxes are highly variable receptacles." Thus began the Wikipedia's entry for "box". This fact notwithstanding, I have to admit that I've given scant thought to these inanimate objects and, especially, what of their kind I'd like to be! After devoting some thought to the matter, however, I'm going ahead and concluding that I'd like to be a box that contains a present and which, when opened up by the recipient of the present, would be party to seeing her -- and I'm definitely seeing a female in this vision! -- face light up with happiness. 5. I think the word "pants" is a funny word. Also "squid." I like to say "arugula." Do you have words (in English or other languages) that you like to say? Hmmm...words that I find funny and like to say or just like to say? In view of the examples that were given, I'd say the former. Okay, then, about the only one that comes to mind fairly immediately is "walaubagaimanapun" (the multi-syllabic Bahasa Malaysia equivalent of the English "although") -- in part because although we were taught this word at school, very few people (beyond grammarians and government officials) really use it in real life! 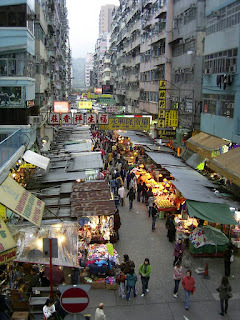 As regular readers of this blog know full well, Hong Kong is a place I love. And while there is a part of me which wonders if one can truly say such a thing about a part of the world where one has yet to actually be a resident, another part of me feels certain that if one could, Hong Kong really would fit that bill for me. This is not least because there really are so many things about the place that I like and admire. For example, and to reiterate once more, Hong Kong -- with such as its annual Hong Kong International Film Festival (HKIFF) and the excellent Hong Kong Film Archive that's open to the public throughout the year -- is "movie Mecca" for me. At the same time, my love for things Hong Kong extends to what can appear to be the mundane: for instance, the very existence of its ultra-nifty Octopus Card, a great public transportation system, and the plentiful amount of street markets and other pedestrian-only or -friendly areas within that densely populated territory. Except that, as a piece I only recently came across -- although it actually first appeared in cyberspace back in September of last year -- makes clear, it's taken quite a bit of thought, planning and implementation to allow the "Fragrant Harbour" to have the kind of exemplary public transportation and pedestrian-friendly set-up that it now does. Even more surprisingly, its author was moved to note that as recently as "in 2001, there were few streets or districts that were comfortable to walk in or engage with despite being known as a bustling shopping city. [But i]n the intervening [five years or so] the city has undergone a major transformation led by none other than the city's Transport Department." Earlier this week, I got tagged -- along with six other individuals she considers to be "strange and interesting people"! -- to reveal six weird things about myself by Bibliobibuli's Sharon Bakar. According to the rules of the meme: People who are tagged should write a blog post of 6 weird things about them as well as state this rule clearly. In the end, you need to choose 6 people to be tagged and list their names. Don’t forget to leave a comment that says ‘you are tagged’ in their comments and tell them to read your blog. 1. I've not worn a skirt in at least five years, and a dress in eleven and a half years. Even as a child, I didn't care much for wearing skirts and dresses. And this before one fateful incident which saw my dress get caught on one of the spikes of the then spiked front gate of my family residence as I attempted to climb over it, with the result that I was left dangling fearfully in mid air for the better part of a few long minutes! 2. I organized Communal Screams at my college. At boarding school in England, a friend took me to an isolated end of the school grounds one day and introduced me to the wonders of destressing by screaming. In my first semester at college in Wisconsin, I decided to take the screaming to a new level by having a whole host of others scream with me at the same time for a fixed period. After getting the permission from the college authorities to organize such an event at midnight on the eve of Finals Week, the Beloit College Communal Scream was born. 3. I used to think that I wanted to have my ashes scattered at Highbury after I died. For those who don't know, Highbury = Highbury Stadium = the home of Arsenal Football Club (the English association football club and team I've supported since 1978) until the Gunners moved in the summer of 2006 to the far more modern plus larger capacity Ashburton Grove (AKA Emirates Stadium). And I used to fantasize that if my ashes were scattered there after I died, my ghost could maybe help Arsenal by doing such as trip up opponents and help block those of their shots that otherwise might have been goal-bound! 4. I ate 96 chapatis in three and half weeks in Kenya. As mentioned in a previous blog entry, I went to Kenya in the summer 1986 at the invitation of a friend and stayed with her family for the bulk of my visit there. But what I haven't written about until now is how much I loved my Kenyan Indian friend's mother's cooking. And in particular, how much I loved her chapatis. So much did I love those home-made flat breads that every meal that we ate in my friend's Nairobi home, be it breakfast, lunch, tea or dinner, I would choose the chapati option over, say, rice or Western style bread. Before too long, this came to be noticed by my friend's mother and the rest of her family, and they decided it would be fun to count the number of chapatis I ate during my stay in Kenya. 5. I was bitten by tsetse flies in Tanzania. As also has been mentioned previously, I spent two years of my life in Tanzania (Kenya's southern neighbor). Towards the end of my stay in East Africa, I decided to treat myself by going on a wildlife safari that took in visits to the ecologically diverse Lake Manyara National Park, the truly vast and animal-filled Serengeti National Park, the seriously awesome Ngorongoro Crater and surrounding Conservation Area, and elephant-rich Tarangire National Park. For the most part, this wildlife safari was a wonderful experience. However, even in this modern day and age, this kind of experience is not without its problems and perils. For example, at one point, one of our Land Rover's tyres developed a puncture and, since an unpunctured spare tyre couldn't be found for miles, the car had to limp along very slowly for a few hours. 6. I have lots of dreams in which I'm doing things like reading, writing, watching movies and -- these days -- blogging. In conversations with various friends, I've been told that they don't dream much. Or, at least, don't normally remember their dreams. 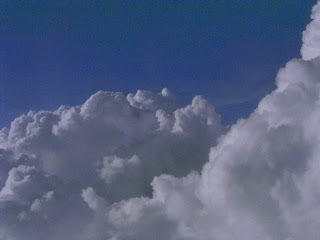 I, on the other hand, feel like hardly a night goes by without my having at least one dream. * Addendum: As per the rules of the meme, this group originally was six in number but two individuals have asked to be "let off" having to write six weird things about themselves. However, if there are any volunteers to replace them from among this blog's readers who have their own blogs, please let me know and I'll happily add two of you to this list! Labels: Arsenal, Beloit, books, Britain, events, Food, Football, Kenya, meme, metablogging, movies, places, schooldays, Tanzania, U.S.A.
As with my previous week's Photo Hunt entry, I can't resist putting up two photos rather than just a solitary one. 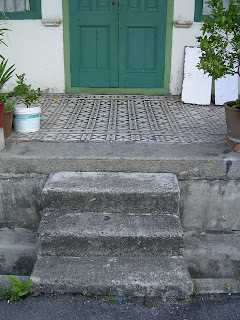 This time around though, only the first image directly relates to the week's chosen theme: i.e., "Steps". However, if you continue your reading, you'll understand why I figured that it also would be good to include the second photograph into the bargain. 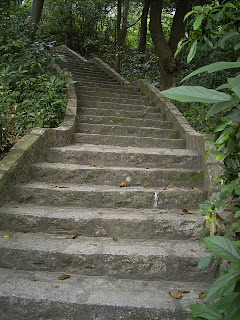 Firstly, here's identifying the steps in the first picture as but a few of the many stone steps which lead up and down leafy Guia Hill. 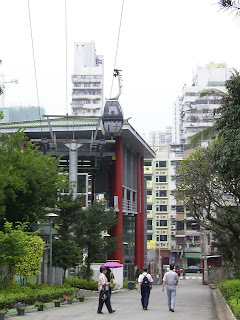 Though it stands at just 94 meters above sea level, this natural point is the highest in Macau (once a Portuguese enclave but, since 1999, a Special Administrative Republic of the People's Republic of China). Atop Guia Hill sits the 17th century Guia Fortress complex which includes a picturesque lighthouse that was the first modern installation of its kind on the Chinese coast. With much of it being open to the public, this historic monument is one of Macau's major tourist attractions. On the other hand, the local folks appear to be much more attracted to the jogging tracks and other exercise venues and set-ups on Guia Hill; and I can well imagine that many of them do regularly incorporate a trek up the stone steps in my first photo as part of their "keep fit" regimes. "Flowers do intoxicate me." So admitted Vita Sackville-West (1892- 1962). And another lover of flowers in Walt Whitman (1819-1892) is on record on the same page of collected quotes about flowers as owning that "A morning-glory at my window satisfies me more than the metaphysics of books" while Emma Goldman (1869-1940) is quoted as admitting that "I'd rather have roses on my table than diamonds on my neck." For my part though, the truth of the matter is that I'm not someone who generally gets all that excited by the sight -- and/or scent -- of flowers. 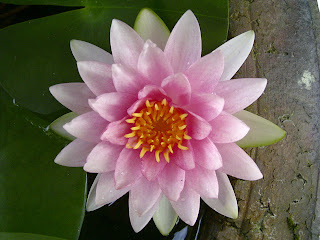 So I'd say that it has to take something pretty special for me to sit up and thoroughly appreciate their very existence. About a month ago, such a thing happened. 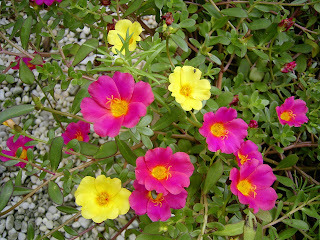 More specifically, one morning, I noticed a profusion of bees busily buzzing around near the window closest to my desk. Upon looking out of said window, I discovered that the bees were being attracted to the bright flowers which seemed to have bloomed virtually overnight on the tree that's situated closest to the window. Today's post seeks to draw attention to some interesting bits in two written works I read today: one of which is the newly re-issued Adibah Amin treasure that is As I Was Passing (written using the pseudonym Sri Delima (trans., "the glow of a ruby")); the other of which is an issue of a magazine that I picked up a couple of weeks back in Hong Kong but only really looked at this evening; both of which provide illustration the divergent ways in which men and women are apt to view matters. A survey of single or divorced people showed that 39% of women over 50 planned on staying single forever, with only 36% interested in a relationship. [But in stark contrast, o]nly 2% of men of the same age wanted to remain single and 90% said they planned to seek a new partner. Then, should one decide to look for some possible reasons why women -- especially of an older generation -- may decide that they would rather stay single, one really could do far worse then to turn to Adibah Amin's collection of amusing newspaper column pieces which were originally written in the 1970s for Malaysia's New Straits Times newspaper. A man, they say, is Nature's eternal challenge to womankind. Just as she feels she is beginning to understand him, he changes completely and eludes her grasp. He is born contrary. Chase him, and he runs for his life. Give him up for lost, and he comes after you, all intense and wild-eyed. He does whatever he likes, goes wherever he pleases, and you must not question him. But try doing one-tenth of what he does and he flies into a jealous rage. ...and what about the metamorphosis of hero into husband? When a man courts you, he is all masculine charm and gallantry. His looks are smashing, his manners dashing. If he does not jump to open car doors for you, this is only because it is not the Malaysian style. He does just about everything else for you and spends the time in between services whispering sweet nothings in your ear. Comes the happily-ever-after you have been dreaming of and what do you get? Your Prince has turned into the Frog, the Beast, the Orang-Utan, the Fire-Breathing Monster of your favourite fairy or folktale. Of course, this being dear ol' Adibah, she does go on to declare an amiable pax rather than continue to add fuel to the gender wars. Consequently, in another piece -- this one entitled Mind the Snails, Romeo ;D -- she decides to contrarily ask "Could it be that men find us [women] most lovable when we are least perfect?" "My younger brother thinks you are very pretty." "In fact, my whole family would love to have you as an in-law." "Would you? Be their in-law, I mean?" Two evenings ago, this year's Hong Kong Film Awards were presented at a ceremony held at the impressive multipurpose performance facility that is the Hong Kong Cultural Centre. In all honesty, I hadn't thought to write about this awards presentation on this blog as there's been extensive coverage of it by the likes of internet luminary Sanney Leung over at his The House Where Words Gather along with professional news media representatives like Hong Kong's The Standard and The Hollywood Reporter. As those of you who have been reading my reports of my 2007 HKIFF viewing experiences (including that which specifically discussed After This Our Exile) should know, the 2006 Patrick Tam Ka-Ming film was one of the highlights of the film festival for me. For all this though, the truth of the matter is that it wouldn't get my vote for best Hong Kong movie of last year; and, indeed, would only make it about halfway up the top ten 2006 Hong Kong movies list I made prior to viewing it. I'm not surprised that Patrick Tam won in this category. However, my sense is that this was a sentimental win more than an entirely deserved one; one which honored a respected film veteran, a pioneer member of the much vaunted Hong Kong New Wave and one who, to boot, was effectively returning from our exile in Malaysia to direct his first film since 1989 more for his body of work rather than on the merits of just his latest offering per se. And yes, my vote in this category would have gone for Johnnie To -- who, on top of everything else, happened to have helmed not one but two truly superb films over the course of a single calendar year. I thought Aaron Kwok was going to win this. But boy, am I glad he didn't. Not because I dislike Aaron Kwok. And, in fact, on the basis of quality performances like that which he's given in Throwdown as well as After This Our Exile, I'm actually re-considering my general policy to avoid any movie in which Aaron Kwok appears. Looking at the Best Actress nominees, I'd have voted for Gong Li too. However, this is not to praise her sky high but, rather, to indict the Hong Kong film industry for not having offered up five truly worthy Best Actress nominees nor all that many meaty roles for females in 2006. Considering that this young fellow was on the screen far more than the credited lead actress of the cinematic offering he appeared in, his role seemed more that of co-star than supporting actor. Add to this fact that After This Our Exile was his first film, I'd say that he performed more than creditably. And so much so that he did deserve to beat even polished veterans like Simon Yam to this year's Best Supporting Actor prize. I'm not going to comment on Zhou Xun's performance since I didn't see The Banquet. Instead, I'd just like to take the opportunity to suggest here that it speaks volumes that a work that was Hong Kong's official foreign language film Oscar nominee -- but which many people look upon as far more of a Mainland Chinese movie -- only garnered a solitary Hong Kong Film Award, and just in this category too! If nothing else, I'd have expected individuals associated with After This Our Exile to triumph in this category. At the same time though, I'd also like to spare a thought for Happy Birthday's scriptwriting trio of Sylvia Chang, Matthias Woo and Theresa Tang since in another year, they could have been winners at the Hong Kong Film Awards. The only person I could have seen seriously challenging Gouw Ian Iskandar for this award was My Name is Fame's Huo Siyan. I get the feeling though that it was too much to ask for this Lawrence Ah Mon directorial effort which apparently didn't get too much critical respect in Hong Kong itself to get honored with more than one award. The nominees list for this award was very impressive indeed and everyone of them put in sterling work which really helped to make the films they worked on look good. Still, the winners in this category did stand out; and not least because visuals were about the only thing that Confession of Pain had going for it! Absolutely no contest here. And if anyone disagrees, I'd wager that it's because they've not seen the eye-popping visual extravaganza that is Curse of the Golden Flower. See the comments that I wrote for the Best Art Direction category and apply them here. My sentimental favorite is Ching Siu Tung -- whose more graceful wire-work style I prefer to the winner's more masculine way-- but, really, it was a well-deserved win this year for Master Yuen Woo-Ping as he served up the kind of action choreography in Fearless that helped Jet Li look the best he has in years. I didn't have any strong opinion here. Frankly, there weren't any film scores that struck me as particularly great last year. ...In contrast, I so loved this Jay Chou song that immediately after coming out of a screening of Curse of the Golden Flower, I walked into a music store to ask them whether I could purchase the film's Original Soundtrack CD on the basis of this one piece of music alone! Like with Best Original Film Score, nothing and no one particularly stood out here for me to have a strong opinion, be it negative or positive. Just a few weeks ago, Hong Kong played host -- and with much fanfare too -- to the first Asian Film Awards. So it seems rather strange that the Asian film that was the most honored at that awards ceremony -- i.e., The Host (which emerged with four prizes, including for Best Film) -- lost out at the Hong Kong Film Awards to another work! But maybe the HKFA voters felt sorry or guilty for pretty much shutting out Zhang Yimou's Curse of the Golden Flower in the main HKFA categories; and consequently decided to give him a consolation prize of sorts by naming another of his directorial efforts -- one which didn't make the Best Film nominees shortlist for the Asian Film Awards! -- as the Best Asian Film at this event!! Well-deserved and it'd be a shame if this awards recipient decides to forego directing any more films in order to concentrate on his acting career.